With a menu that pleases the most sophisticated of palates, feast on imported Asian fish, seafood, sushi rolls and exotic delicacies. 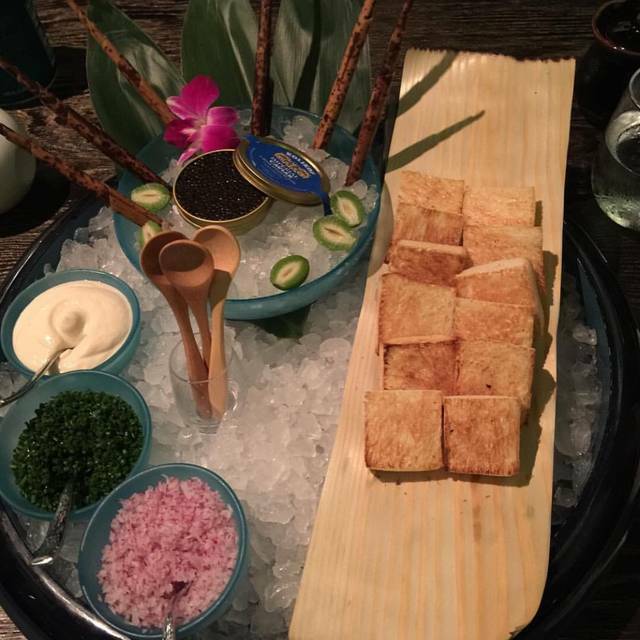 There are always delicious surprises in store when perusing the Nobu menu. 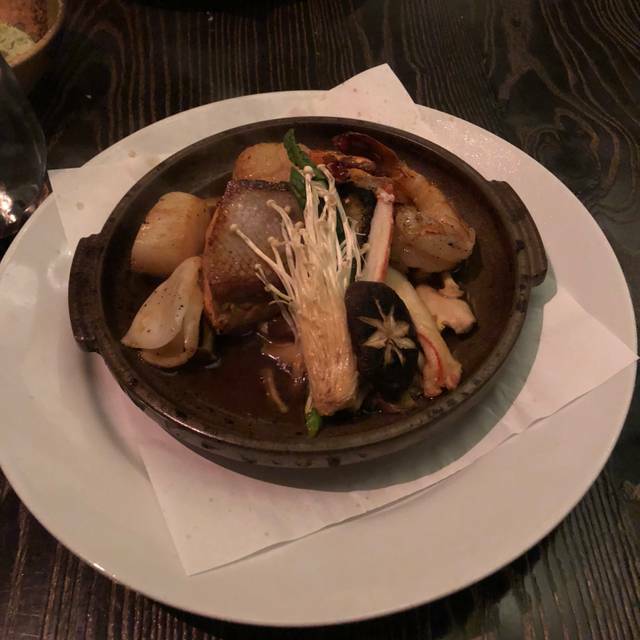 The most popular dish is the signature Black Cod with sweet miso. Socialize and be seen in the stylish Nobu Lounge, great for cocktails, dates and large parties. 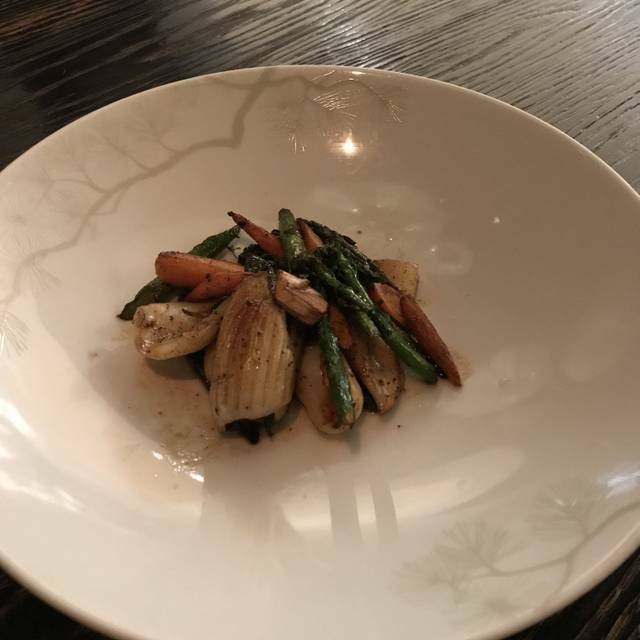 The exclusive lounge menu features appetizing items not available at other Nobu locations, and available only after the main dining room closes. In the mood for sake? Nobu stocks three rare sakes from Japan's Hokusetsu brewery on Sado Island, one of which is made by hand and goes through a slow drip process. Best sushi I’ve ever had! Our server was amazing, explained everything and didn’t try to up sell us. The food sells its self! Try a mix of hot and cold dishes. Excellent atmosphere and food! You saw people ranging from a group of friends to couples. Every time I come toVegas, I have to eat at Nobu. Wonderful, fabulous place to have an expensive dinner. We loved the yellowtail with jalapeno peppers (it's just a little spicy, not a lot), and the cod in miso was melt in your mouth. It was a birthday celebration, and the desert was unbelieveable, buttercream stuffed cigars and passion fruit macaroons with a lovely Happy Birthday written on the plate. The ambiance is wonderful, the service superb, choice of amazing teas (we didn't have alcohol, but of course they have an amazing choice of sakes and the usual). I must say that even sitting pretty close to the table next to us sound levels were surprisingly low. I would absolutely go back again if we are in Las Vegas. And if you valet park at the Forum Shops valet, it is $7 instead of $15. We let the chef decide our courses, cold foods first, then hot, then sushi, and added a couple others. Amazing presentations and delicious. One of our group’s best dining experiences ever! I ordered the lobster ceviche. It was okay. Nothing spectacular. I than ordered the matcha cigar dessert. The cigar part was like an egg roll but matcha flavor, filled with cream. It was wayyyyy to sweet in ratio to the sponge cake provided. The balance was not there. The only tasty thing on the dish was the macaroons. I heard good things about the restaurant in regards to Japanese food. But they are also a South American restaurant. I don't recommend ordering the South American food part. It was mediocre. Mix Tokyo with Lima, Peru. Not a marriage made in heaven. Spices conflict, extremely small dishes, kept trying to clear the table mid-courses. The customers seemed peripheral to their mission. Amazing food and the waiter chose all the food for us based on our preferences and it was excellent! Fabulous cocktails too! 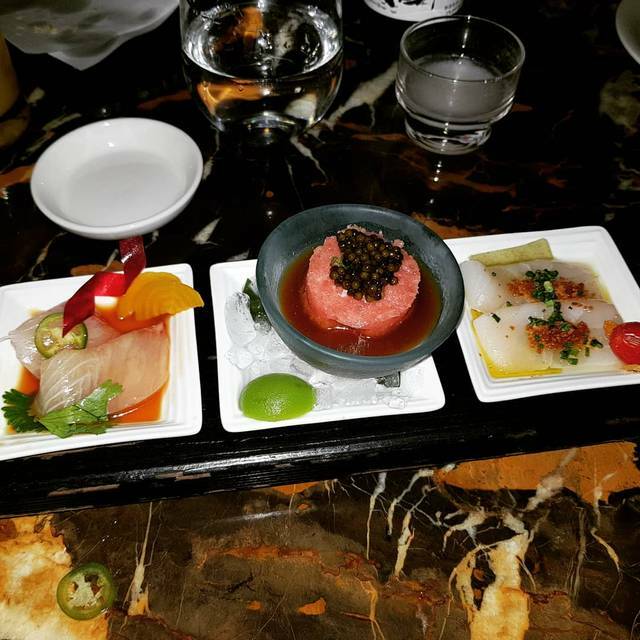 Everything at Nobu was delicious and the service is fabulous. Loved every single dish we got and the waitress was super attentive. Outstanding food and service! The food was beautifully served and the taste was off the charts. Our server was awesome! Wonderful experience all around. My 16 year old was blown away as well! Fantastic as always. It’s expensive, but the food is delicious. Whenever I’m in Vegas, I always make it a point to eat here. The food we ordered was very flavourful but do not go if you are hungry. We were told the portions were small by our waiter and he wasn’t lying. Started out with Japanese snapper and it was very good but only 6 small pieces. We then had the tenderloin (maybe 5ounces ) and an Alaskan crab leg. I emphasize leg because we got one leg. Flavours were dynamite but go expecting to order a few dishes if you want to leave full. I would think a minimum of $150 a person is what you should expect to pay. 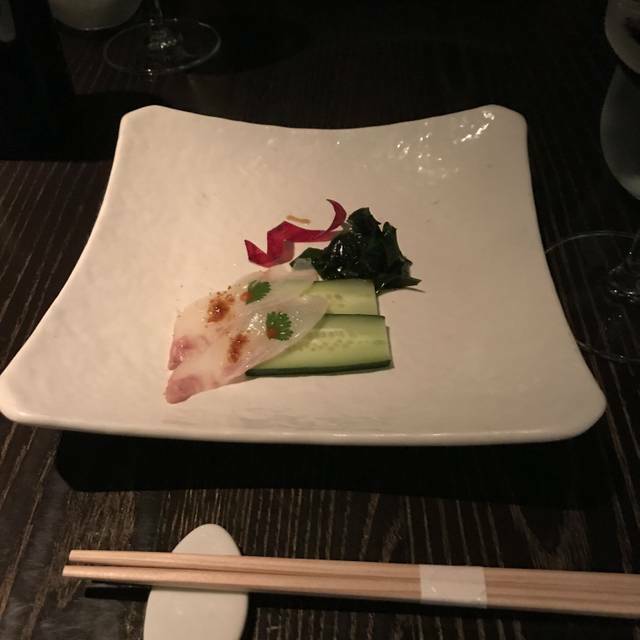 Food is great wherever you are at Nobu ...in this Restaurant the level of noise is comparable to a cantine - the service not very knowledgeable regarding drinks and food. It would be great to have service with a higher level of education regarding this outstanding food - incomparable! This restaurant is one of the best in Vegas. The fish is flown in from Japan daily, what else could you ask for? Service was top notch and the chef's suggestions were spot on based on our requirements. Would absolutely return. Delicious food as usual. Nice ambiance and very good service. We went to Nobu specifically for our friend, whose 40th birthday we were celebrating. He had been looking forward to this experience for quite a while. I made the reservation and we specifically asked about the omakase, as this is the what my friend and really all of us wanted. After we sat down our server explained the omakase system to us in great detail and talked up how wonderful an option this would be. We were all very excited to hear this and were looking forward to all having omakase at the table. In the middle of taking our orders, however, she suddenly hesitated. She then completely changed direction and said that it may be too late to get the omakase. Apparently, there is a cut off for this at 10:00, however, this WAS NOT indicated anywhere that I looked and also when we had called a few days ago. 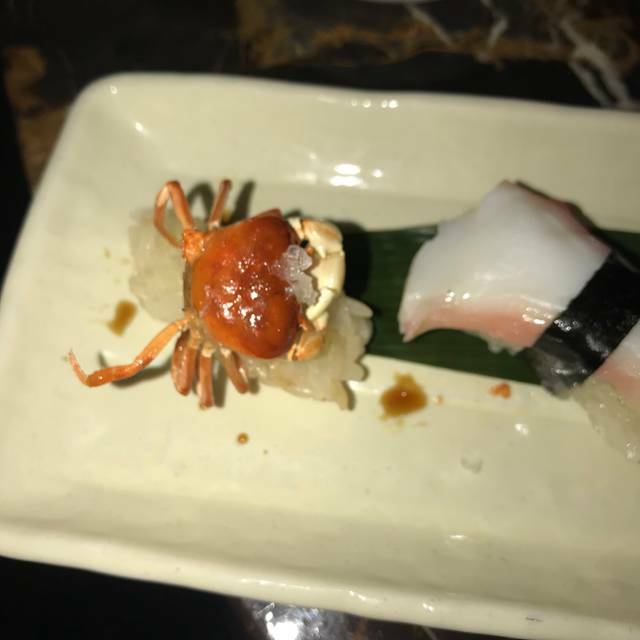 Our server then tried to smooth things over, talking about customizing the experience even though we could not get the omakase menu, however, this never happened. We simply ended up ordering items from the menu to share. We were all very disappointed at this point, and with the overall experience. I would recommend that if there is a cutoff for certain menu items, it is made very clear in multiple places. This was my friend's 40th birthday dinner, and needless to say, he was less than pleased. I was hoping that this would be a great place for a special occasion such as this, however, it did not turn out that way. Honestly, the service was poor and that made the rest of the meal not very enjoyable. I am from a major and expensive US city and this was grossly overpriced. Definitely would not go back. 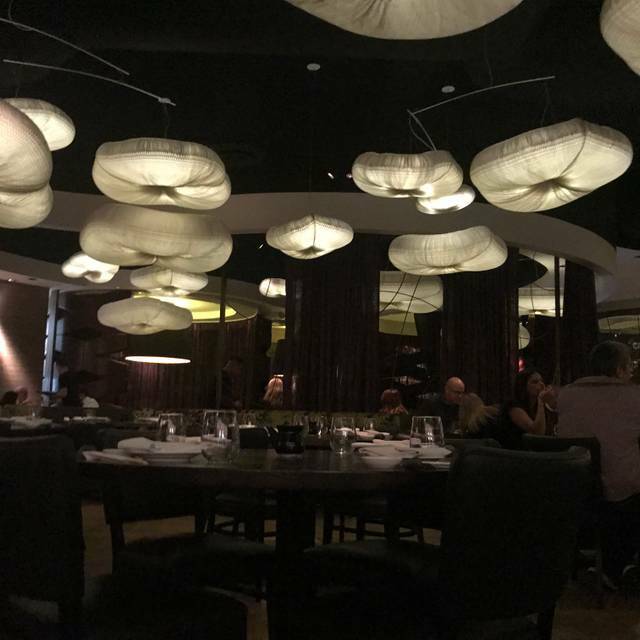 We made it a point to try Nobu before we left Vegas. We came for a girls trip and we were not disappointed! We tried the sushi: California rolls and shrimp tempura. That was the only thing we thought was alright and not wow. But the lamb chomp, wygu beef dumplings, the beef tenderloin, ceviche, soup, and mocktails were all amazing! We also had the lobster tacos which were yummy too! The appetizers are very small! Please make sure you get several, the entres are plenty for one person, so don’t share them! Wonderful food, we will absolutely come again! Food was excellent. Our server was just ok. Not energetic and no sense of humor and forgot a few things. Incredible as always. The recommendations are always spot on. The service is great. The room is beautiful. 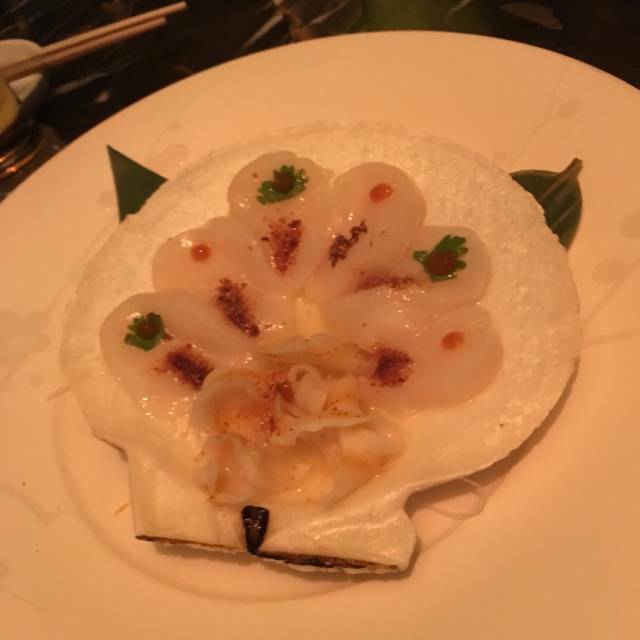 Nobu met all of our expectations and beyond! The food was amazing and we had the best waiter in the place. Highly recommend and can't wait to go back! 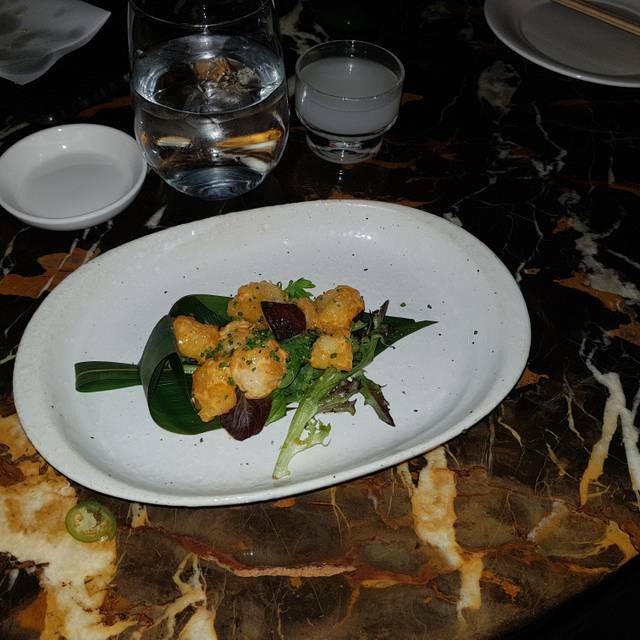 Nobu, Nobu, Nobu ..... let me just start by saying the hype is HUGE and to be honest it was very good but really not OUTSTANDING as we had hoped for. The service was amazing from the time we got in to the time we left, everyone from the hostess to the servers and managers everyone was very friendly, helpful and knowledgeable of the menu. The food was good but again I don't think the prices matched the food, we have been to very good restaurants and again this one was good but not OUTSTANDING. I feel like we could had gone to another good sushi restaurant and experience the same quality of food at half the price. Would I ever come back to it, probably yes but it wouldn't be something I would make as a MUST go to. Great food. Reasonable price to portion for the quality (though feel the shiitake salad was heavy on salad and light on shiitake). Overall, excellent, but still have preference for Miami location. Save your money. While the service was good, it was rediculosely over priced. $70.00 for one crab leg. In fact, all of the food in Vegas, was three times what it should have been. This dining experience was amazing! The waitress made suggestions that were fabulous and we would not have known to order those dishes on our own. She was wonderful! The best dining experience we have had out ever! Generally Nobu is spot-on all around. This location felt too busy, and the service suffered a lot. I felt very rushed through dinner - to the point where I was eating my (delicious!) spicy tuna with crispy rice and the waiter took the main plate out from under me while I was still eating, leaving me just a little side dish of fish with no soy sauce! I’m sure turning tables quickly means more profit, but I won’t be excited to go back to this spot on a busy night - I’ll try a different location. (Note - the food was all fantastic. Love the yellowtail jalapeño - soooo good). Made a reservation more than a week ahead. 21st Bday dinner for our daughter. We go the table directly behind the host and beside the bar. Who doesn’t like to watch sports and listen to complaints about the wait for a table while men wander around in a daze hoping a $20 will speed up the process. The table location sucked. The rest of the experience was a wonderful culinary journey. Michelle asked some questions and then took care of the rest. The food, while not abundant, was incredible. The service and attention to detail was outstanding. The personnel work very well together leaving no detail unattended. Loved the food! Most expensive meal EVER in my life! We knew there was a less expensive way to do this restaurant, but we wanted to go out with a bang. We had 2 fancy menu cocktails and 2 glasses of beer for the table and a chef special for the table. Amazing food. Great service. Too darn expensive. Just over $900 for 3 people including tip. Holy s#*t! We went for our annual anniversary dinner, and we were not disappointed. We love the chef’s menu. The Miso Cod and Yellowtail are two of our faves, but the king crab leg and tenderloin were the clear winners tonight! There was some miscommunication with the waiter. I told him we wanted to spend $200 total and he was bringing food totaling $200 per person. It hit me when the tenderloin came out that the items seemed much more high end than our usual fare. When I told him, he spoke with the manager and they got our bill down to $299 with tax and our beverages. It was still more than I planned on spending, but they comped out a huge amount to get it down to that. So, I didn’t fuss. I will say that I will budget more for next year because this was the best meal we have had at Nobu in our few years of attending!